MONDAY, Nov. 10, 2014 (HealthDay News) -- Only one in two young American adults with high blood pressure gets advice from a doctor on lifestyle changes, a new study finds. Lifestyle changes are critical to helping young adults control their blood pressure, and they cover areas such as exercise, weight loss and healthy eating, the researchers said. 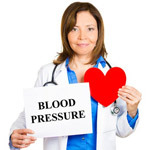 Among Americans aged 18 to 39, an estimated 9 percent of men and 7 percent of women have high blood pressure. Of those, nearly 60 percent are not good at controlling their blood pressure, the study authors added. In this study, the investigators looked at lifestyle counseling rates among 500 young adults with high blood pressure being treated at a large Midwestern academic practice. Only 55 percent of the patients received lifestyle education within one year of being diagnosed with high blood pressure, the study found. The most common topic was exercise, followed by advice on quitting smoking. Only 25 percent were counseled on how to lower their blood pressure by changing their diet. The study was published online Nov. 6 in the Journal of General Internal Medicine. Those most likely to receive lifestyle counseling included women, patients who made regular visits to the doctor to manage long-term health problems, those previously diagnosed with high cholesterol, and people with a family history of high blood pressure or heart disease. The findings show that doctors are missing far too many "teachable moments" to advise young adults with high blood pressure about lifestyle changes, study author Heather Johnson, of the University of Wisconsin School of Medicine and Public Health, said in a journal news release.